I've been taking notes... cute shapes cut with cookie cutters. cute animal dividers peeking out. tofu shapes and sprinkles on fruit. 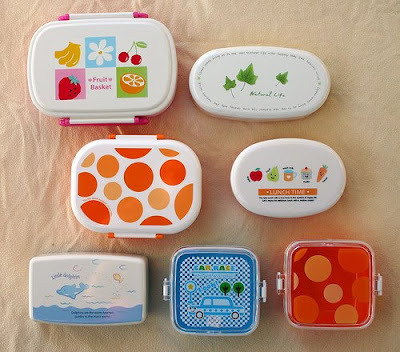 But of course the best part of bento lunches are the super cool containers. 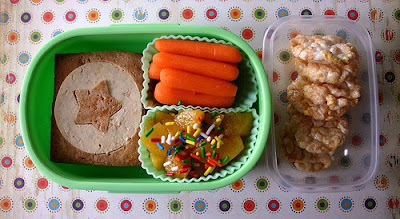 Anyway, I'm still a rookie but since Lo has had a hard time branching out on her food choices lately, here's her simple lunch from today. 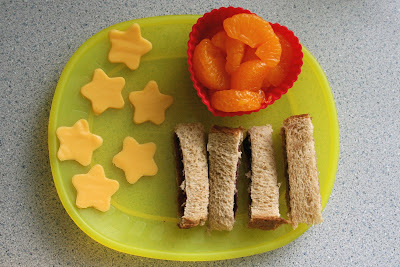 We'll settle for grape jam sandwich strips and cheese stars on a plate for now. 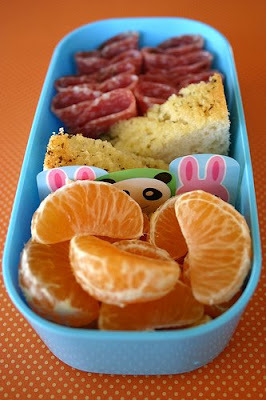 Luckily, I have a little while before she heads to preschool to hone my bento skills. Thanks to Wendy for the fantastic ideas. How fun!! 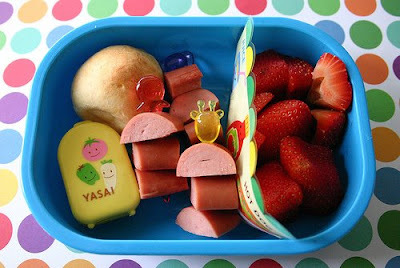 I want a bento lunch!! Wow! Thanks for the link. 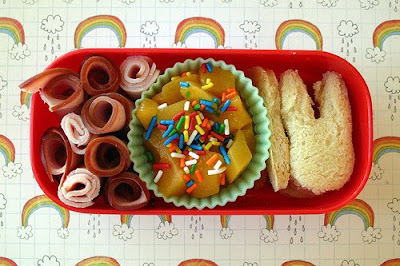 I love the lunch you made for your little one. It looks like a lunch I'd pack, just spread out a little more. 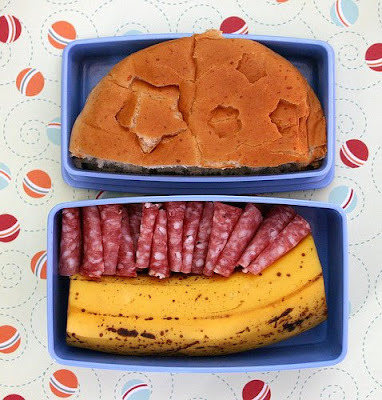 i thought i was going to make myself bento lunches to keep down the calories, for like all of 2 seconds. but, of course, because i'm me... i rushed into it and bought tons of stuff. i will totally send it to you, because it is obviously doing nothing at my casa other than taking up prime cabinet space. would make me eat and i'm not even a toddler. so brite and cheery! lucky they have moms like U 2!! This is great! 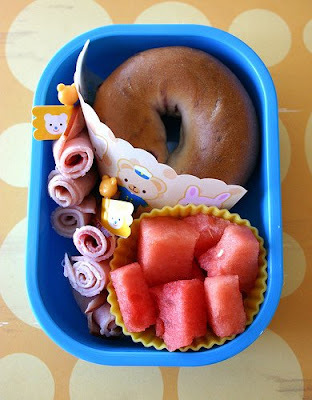 I love the concept and it would surely cause any kid or grown up to look forward to lunch time! Thanks for sharing your lunch! you are adorable! i've read that blog, so cute! 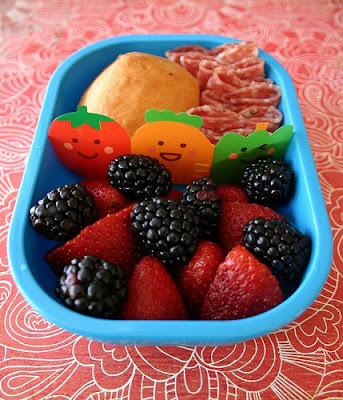 a scrapbooker + bento = the perfect combination! 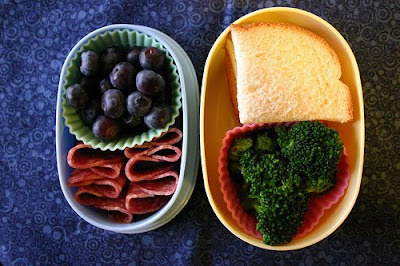 Bento boxes are so fun. 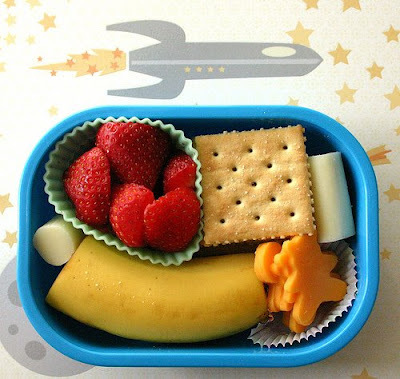 Love this post and all the pictures of the different Bento lunches she packed for her child. So cute! This is so great. 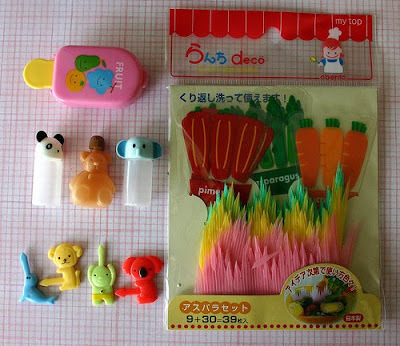 I bought my daughter a bento book for kids and I plan on packing my son's lunches that way when he starts school next year. 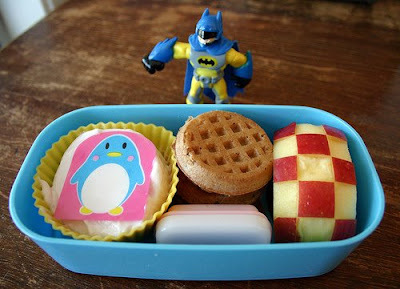 I saw the cutest lunchbox that I have bookmarked just for him. I might get one for me too.